Chamber Music at the Clark concert seating is determined via lottery. The booking-by-lottery entry form for Zorá String Quartet concert seats posts here on Thursday, October 5, 2017. Lottery registration closes Thursday, October 26, 2017. Recognized for its virtuosity, exuberant performance style, and daring repertory choices, over the past two decades the Pacifica Quartet has gained international stature as one of the finest chamber ensembles performing today. The Pacifica tours extensively throughout the United States, Europe, Asia, and Australia, performing regularly in the world’s major concert halls. 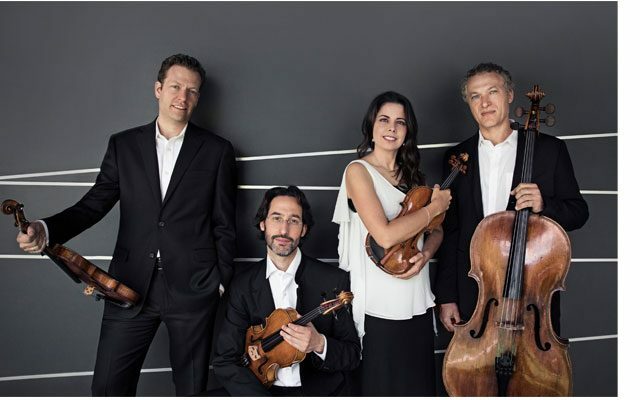 The ensemble is a recipient of the Naumburg Chamber Music Award (1998) and was honored with Chamber Music America’s Cleveland Quartet Award (2002). The Pacifica became only the second chamber ensemble to earn an Avery Fisher Career Grant in 2006. The group won the Grammy Award for Best Chamber Music Performance for its recording of Elliott Carter’s String Quartets Nos. 1 and 5 (Naxos) in 2009. That same year, it was named Ensemble of the Year by Musical America. Appointed the quartet-in-residence at Indiana University’s Jacobs School of Music in March 2012, the Pacifica was previously in residence at the Metropolitan Museum of Art (2009–2012)—a position that has otherwise been held only by the Guarneri String Quartet.